Hi and thank you all for another wonderful Hotel Lake Glamping experience! We shall be contacting you again this fall reserving for next year I'm sure. Firstly.... trying to transition back into everyday life after such a great trip has been hard! We had an amazing time and absolutely loved our time in the RV. Thanks for [everything] and the trip back to Vancouver on the Sailboat was an unforgettable experience. Thanks again to everyone at Happy Holidays, excellent friendly service! sauberen und perfekt ausgestatteten Camper benutzen zu durfen. Wir haben uns jeden Tag von neuen gefreut. Wir haben eure Kontaktdetails bereits an Camper-Interessenten aus Osterreich weitergeleitet. Vielen dank nochmal fur den tollen Urlaub, die vollig reibungslose Abwicklung und eure klasse Unterstutzung. die erste Wahl fur uns. Vielen Dank an euch alle fur die wundervolle Zeit und die hervorragende Mietmonglichkeit. you may have a few booking from Hong Kong based families next ssummer! We hope to do this again so maybe we will see you next summer! My fondest memory from our trip: a swim in the fresh water Waugh Lake. We really enjoyed our trip and the country was amazing, we surely took a lot of great memories with us (and pictures!). we'll surely remember you when we come back to BC. Park (Osoyoos), Merrit and Harrison Lake. a dream to deal with from planning, Rainer's excellent instructions, to the price being fair and exactly as quoted. went out of their way to answer our many questions and worked together to make this adventure perfect. great hosts and the cleanest washroom and shower facility we have seen. were professional, personable, and so helful! We will certainly recommend your company! Have a good summer, and thanks again. no problems during the whole stay, and really now it (the motorhome) is also part of our best memories! Dear Yvonne, thank you very much for your email. "Tioga" in very good memory and love to recommend it to family and friends for a booking. recommend to friends and family traveling through Canada. planned our time and booked all the campsites. enjoy it again and again in years to come. I would also like to add how delighted Adrian and I were to meet your countrymen throughout our time in Canada. Everyone, whether in the city or in a lay-by, could not have shown us more kindness. hiking, mountain biking, rafting and we got engaged at the end. It was a trip of a lifetime and we will not forget it! Thanks also for looking after the red gerbera, the flower travelled the whole journey with us! Bereits vor unserer Reise hatten wir sehr freundlichen und hilfsbereiten Emailkontakt zu Happy Holidays. Wir konnten sogar die Uhrzeit für die Wohnmobil Übernahme selbst bestimmen! Die Abholung vom Hotel in Vancouver klappte problemlos und nach der Fährfahrt nach Gibsons stand unser Wohnmobil direkt am Parkplatz des Fährterminals für uns bereit. Die Einweisung durch George war sehr herzlich und freundlich. Nach ca. 45‘ rollten wir los in unseren Urlaub. Unser Wohnmobil (C26-27) war 3 Jahre alt und soll nach Auskunft von George Ende der Saison ausgemustert werden. Es hatte 80.000km gelaufen und war in einem einwandfreien Zustand. Alles war pikobello sauber und funktionstüchtig. Über die Farbe der Inneneinrichtung und der Polsterbezüge kann man geteilter Meinung sein, aber Qualität und Funktion waren tadellos. Wir haben bereits mehrmals Wohnmobil Urlaub gemacht und wir müssen sagen, dass es bei Happy Holidays wirklich an nichts fehlte. Es gab mehr als genug Handtücher, die Küchen Utensilien waren sehr reichhaltig und die kleinen Details (Grill mit Gasflasche und Grillbürste, Wäscheleine und – klammern, Werkzeug, Pannenset, Putzzeug, Reisetips) haben uns sehr erfreut. Auch die Abgabe am Fährterminal in Gibsons verlief schnell und völlig unkompliziert. Von Horseshoe Bay brachte uns das bestellte Taxi zum Flughafen. Wir waren vor der Reise etwas skeptisch, ob wir durch den großen Preisunterschied zu den anderen großen Anbietern vielleicht größerer Abstriche in der Qualität unseres Wohnmobils hinnehmen müssten. Aber diese Sorge hat sich in keinster Weise bestätigt – ganz im Gegenteil. Dadurch, dass es ein Familienunternehmen ist und wie wir gehört haben „swiss operated“ ist, wird viel Wert auf Qualität, Pflege und Details gelegt. Einziges Manko ist unserseits der hohe Sicherheits-Deposit auf der Kreditkarte von CAD 4500,-. Das ging aus unseren Reisunterlagen von CU Camper nicht ganz so hervor und traf uns dann bei der Wohnmobil Übernahme etwas überraschend und unvorbereitet. Nach kurzer Rücksprache mit CU Camper wurde uns aber unbürokratisch und schnell geholfen. Tipp: vor der Reise nochmal bei CU oder Happy Holidays nachfragen und das Kreditkarten Limit entsprechend anpassen. Almost I forgot to write you and your team very big THANK YOU for super nice holiday. With my friends we were satisfied and enjoy in Canada with everything. In addition all organisation things – taxi from hotel, pick up (and return) of motorhome – were excelent. We've been back home for a couple of weeks now and we still speak all the time of our 6 week vacation and keep looking through the loads of pictures taken. We have had an awesome vacation, also due to the motorhome rented with you. It was our home away from home for 5 weeks and it were a very comfortable 5 weeks. We appreciated especially the accessories that were included such as the large quantity of towels, the drying line and pins, the axe and cast iron skillet for campfire cooking, table cloth. We have stayed 'off grid' for several days without ever having to use the generator and the kids loved to shower in the motorhome. Back home we recommend Happy Holidays to anyone who asks. The pre-arranged taxi rides to and from the ferry to the hotel, the care and time given to explain the motorhome usage during pick-up, the quick drop-off are among the things that make you stand out. If we will come back to BC (and there is still plenty to see for us there) we will definitely get back to you. Our trip brought us from Gibsons to Tofino, Victoria, Nanaimo, Whistler, Nairn Falls, Kamloops, Wells Gray, Jasper, Icefields Parkway, Banff, Calgary, Kelowna, Manning Park and back. 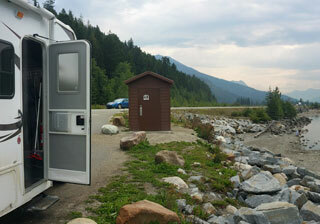 I have attached a few photos of the motorhome in scenic settings. nochmals vielen Dank -- wir hatten eine sehr schoene Zeit in eurem Motorhome und wollen unbedingt nochmal kommen. 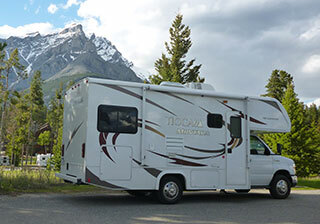 Muss natuerlich zeitlich und finanziell passen....."
"My husband and I and 2 other couples from Australia hired 22-23ft motorhomes for 20 days in June and travelled around the Rockie Mountains and Vancouver Island. The service provided by Yvonne and her family was exceptional, and coming from Australia we were grateful for all her assistance and advice for our trip, including sending a detailed itinerary. The motorhomes were fitted out with everything we needed as part of the standard hire rate, which was also much appreciated. 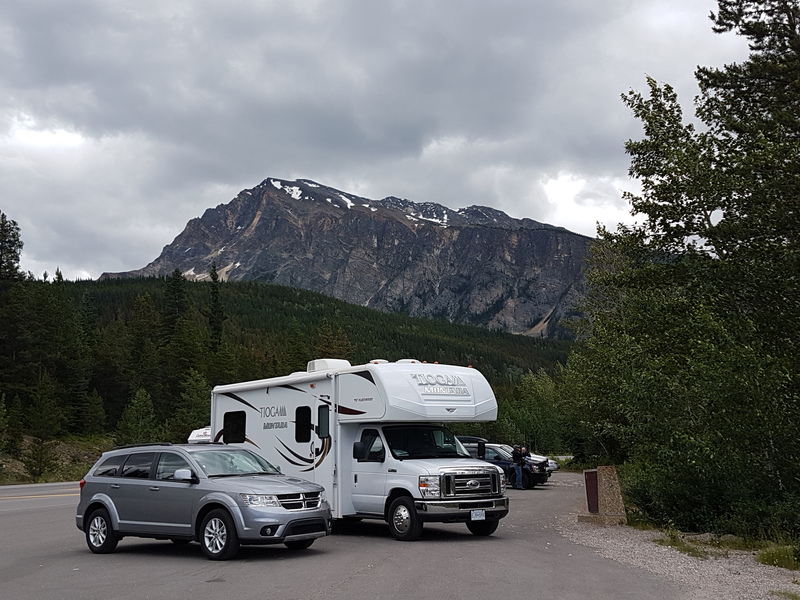 We saw some absolutely spectacular country, particularly in the Rockies, and the motorhomes provided us with the freedom and flexibility to change plans during our trip if perhaps the weather wasn’t good or we wanted to visit places we didn’t have on our itinerary. 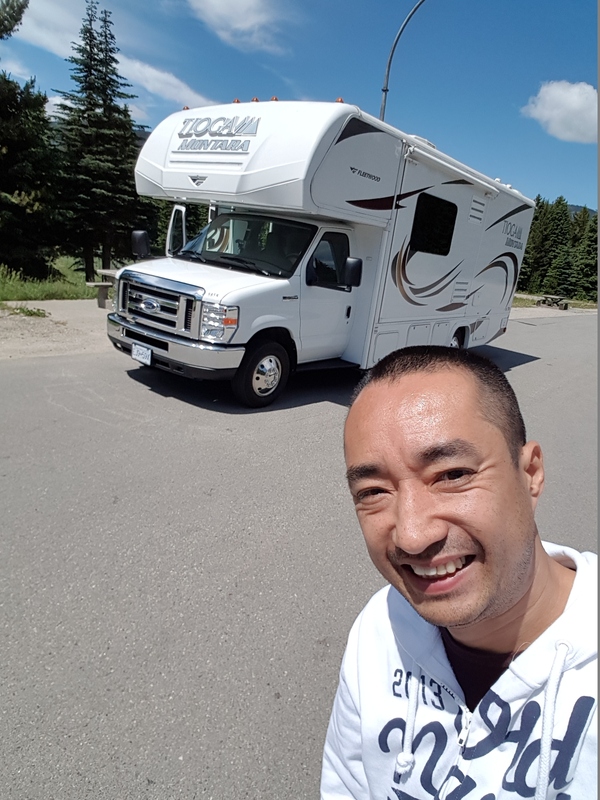 We would love to come back and visit Canada again and if we get the opportunity, we will definitely hire our motorhomes again from Happy Holidays, and we will recommend Happy Holidays to all our friends interested in visiting Canada. Thank you again for the wonderful service Yvonne and I hope we can meet again sometime into the future. Best wishes,"
Thank you for all the service. You have a great company and i will recommend it to everybody who his traveling to BC. Tomorrow i will write a good commend on your internet site. When you have or know a nice deal for a 4x4 camper, please let me know. Here some nice pictures. When you like to used them on your site a can send them with a higher resolution. Firstly, our sincere apologies for the long delay in contacting you once we returned to Belgium. Suffice to say our holidays ended swiftly, and we found ourselves wrapped up in busy work as soon as we got home. 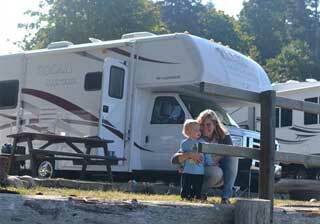 We are so very pleased that we chose to spend our vacation in Canada, and especially that we rented a motorhome from you. From the initial contacts right up to our arrival, and even when on the road, we really appreciated your knowledge and patience with our many questions as first time rv'rs! The time that you took on the first day of our rental to talk and walk us through how to manage the rv gave us great confidence, though we did not drive very far on the first night, staying at the rv park next to your place! Rainer joked with us that we would gain confidence driving the motorhome and he was right. The personal touch to explain where to eat in town, buy groceries, refill the gas on return, even which entrance to drive in at the mall........all these suggestions we followed, making our vacation hassle free from the moment we left Gibsons to when we returned. Being able to contact you by phone during our vacation, with admittedly rather silly questions, helped to get us back on track again. We found the motorhome so well equipped, it was clear you have thought of everything! From the paper towel wrapped plates and glasses so they don't clink while driving, to the table cloth and night lights for a romantic picnic at a park bench, we found our every need catered for. Despite a wet start on arrival, and our luggage remaining in Europe, we enjoyed the holiday of a lifetime. 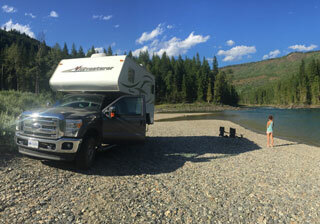 Of course the warm weather and scenic landscape of western Canada played a part, spending our vacation on the road, free to go wherever the road leads, now means that we consider ourselves rv'rs!! When we see a rv on the road here in Europe, it brings such happy memories. We hope to plan another trip to Canada, and for sure we will rent a rv again from you. We had already posted a few comments on a Tripadvisor forum post about how the communication had been really good prior to our trip and we will make sure to post another one as soon as we get a chance. In the meantime do not hesitate to share/publish this email on your website. Thanks again for helping us to arrange such an unforgettable vacation." "We really enjoyed our experience here at the Sunshine Coast in your wonderful RV. It was perfect for our wants and needs. Thank you! We wish you God's Blessing in your life." First of all, let me thank you for the excellent service. From the moment we received our RV we knew we made a good decision going for Happy Holidays. We were very pleased to see that practically everything that might come in handy during a roadtrip was on board. From the axe to the camping chairs, the little games for rainy evenings, pots and pans,... Really everything was included. 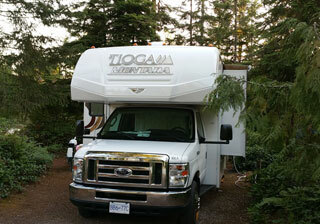 The vehicle was very clean and well maintained, even though we rented a B-class RV that was a bit older. The instructions we got from Rainer were very good. As this was the first time both of us went camping this way, he took the time to explain everything in detail. Also very convenient was the information we got about Gibsons and surroundings. We didn't plan on camping in Gibsons for our last night but after some consideration this was by far the best idea: we had plenty of time to clean the RV, dump the black/grey water, fill up all our tanks and deliver the RV back by 10AM. On top of that we spent the night in a nice RV park (Langdale Heights) were we overlooked the golf course and the mountains whilst warming ourselves on a little campfire. Excellent way to end our trip, and something we would've overlooked without the information Rainer gave us. I didn't have the time yet to sort out my pictures, but I'm sure there's some good ones showing our mobile home in it's full glory. I will e-mail them to you asap. I will highly recommend Happy Holidays to anyone who is planning on visiting BC/Alberta! Thank you for sending the final balance for our holiday and for all your help and support throughout since we made our first enquiry about an RV holiday. The service, personal approach and the attention to detail that Happy Holidays provided has been first class throughout and I can cannot recommend your company more highly. Everything was terrific and we shall return! Thank you for the information about the charger. I cannot think what it might be so perhaps best to dispose of it as you see fit if you are happy to do so. Thank you also for your help with our luggage at the ferry! I look forward to seeing you again when we return and would be happy to write a more detailed review if you would like me to. Please pass on our sincere thanks to everyone in your company. We had a truly wonderful holiday. We'll definitely consider doing the same sort thing again in the next few years and will definitely recommend you guys to our friends and colleagues. Thanks for the extra kms! Thank you for you best wishes. Yes we enjoyed our trip very much and consider it a success, thanks in large part to your services and the vehicle you gave us in custody. Wishing you all the best, With kind regards,"
"Wir waren mit dem Wohnmobil, der Ausstattung und der Sauberkeit sehr zufrieden und haben den Urlaub sehr genossen. Auch das Service, die Kommunikation und die Leistungen von Euch waren immer super, schnell und sehr freundlich. Wir werden Happy Holidays sicherlich weiterempfehlen und hoffen bald wieder eine Reise mit einem Eurer Wohnmobile für das restliche BC machen zu können J Fotos folgen." thanks for the invoice. We had a great time and we were very happy with choosing Happy Holidays as our RV rental provider. I’m sure that next time we’ll come back we will definitely get in touch with you again. "Thank you very much for all Happy Holidays did for our fantastic holiday this year. We had a truly memorable time on our road trip tour of Southern BC. Happy Holidays played no small part in that. From initial booking, through pick up and to final return, everything went like clockwork. I am still wondering how you knew which ferry we caught on our first day, which enabled you to be at Langdale to meet us so promptly. The Happy Holiday teams advice and practical help was invaluable to us in the smooth running of our holiday. It made for a very enjoyable relaxing holiday. We have taken away many, many great memories of our trip the land of the Maple Leaf. Thank you once again and we will surely be recommending you to others who may be planning a similar trip. With any luck, we may be back ourselves!! "It sure has been a pleasure to meet you and be in contact with Norman and Yvonne the months before. We're glad we have chosen Happy Holidays! Whats' left is we look back at a beautiful trip and all the pictures. We'll be back!" My girls were thrilled to bits with the teddy bears, thank you for such a nice clean, well stocked unit! Even board games, a level and axe. You really thought of everything! Thanks and see you on the morning of July 6th"
"Thank you so much for your support and the wonderful, very nice motorhomes. We had a fantastic vacation and we will recommend your rv's to all we know and ask. Thank you very much and we will meet again. "Thanks for your email and yes, we had a fantastic holiday. None of us wanted to come home. We all want to thank your team for everything. It was a lovely clean motorhome and things could not have been run more smoothly. If we are lucky enough to come back to Canada again , we would definitely contact your goodselves. Enjoy what's left of the summer. "After a long flight from the UK we took the short ferry crossing to Gibson and were met off the ferry with the vehicle, we found the introduction to the RV informative and explained in an easy to understand way. The vehicle was better than my expectations, everything clean and organised, as I am an engineer I liked little touches like spare sealing washer on hose, can save so much time and grief, obviously Happy Holidays have experience and are happy to go the extra km to make our journey a pleasant & memorable one for all the right reasons, with it’s powerful engine we covered 2135km in a week. From Vancouver airport using Happy Holidays entails a short ferry crossing but they reimbursed us and gave us a taxi for our onward journey, Thank you very much, would use you again." Thank you for the great service you provided. We thoroughly enjoyed our holiday and thought the motorhome was excellent. We have already recommended you to family and friends. We plan to return in the future. Thanks for our final account, we had a really good four weeks in your motorhome and we would love to do another trip and if we can it will most definitely be with Happy Holidays, we must compliment you on the way you operate, the equipment you supply and all the people on your company that we had dealings with either on the phone or in person. We have recommended your company to several people on web site groups who are thinking about a similar trip, those groups are Motorhome Adventures, The Motorcaravan Club and The Autotrail Owners Group. We are now preparing our own motorhome for a trip to Scotland followed by a trip to France in September Once again many thanks Regard"
Chris and Rosemary Palmer, U.K.
"We were very pleased to have used Happy Holidays for our one month RV holiday trip. Their service was excellent during all stages of the holiday from booking through to returning the RV etc. The trip over to Sunshine Coast is an enjoyable and adventurous way to start the holiday. 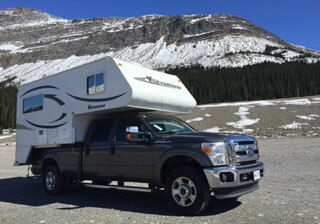 The RV was superb and we benefitted greatly from their experience in choosing the right one. Rainer was exceptionally personable, informative and helpful and made an unannounced extra trip to see us at the ferry terminal when we were leaving for our holiday to see if we needed a child seat (which we did not). Thank you for making our precious month family trip in an RV such a success at great value! We would recommend you unreservedly." 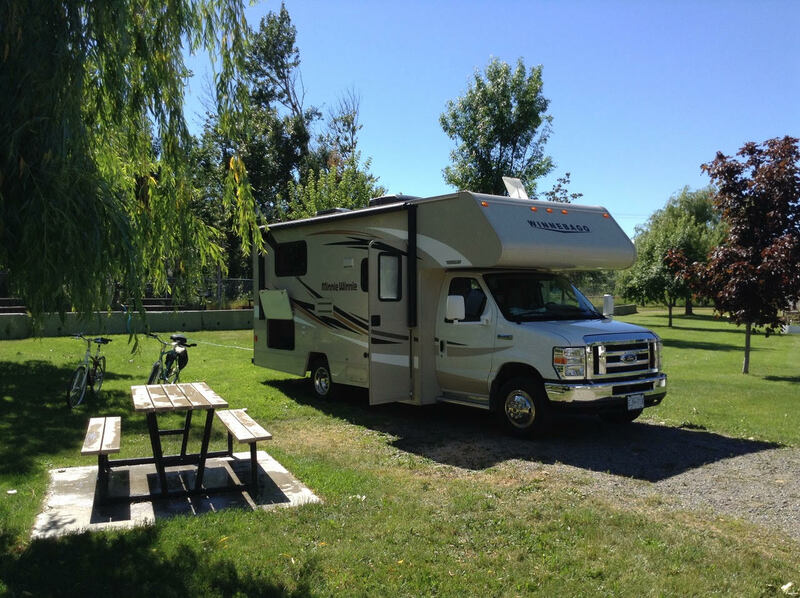 "We thoroughly enjoyed our time cruising around the Vancouver area in our Happy Holidays RV. The whole experience was easy and fun. Starting our trip from Gibsons gave us a good reason to explore the Sunshine Coast....something I would definitely recommend. Beautiful coves, well equipped RV Parks and easy driving made this a perfect way to acclimatise to RV living. We were traveling with our 3 year old daughter. She also loved the experience, lovingly renaming the RV our snail home (because we had our house on our back!!). Being able to unpack our bags on day one and collect supplies from the shopping centre in Gibsons meant we could easily drive around without too much of a plan and stop where we saw a good spot. Yvonne and Rainer are lovely and very helpful. They arranged for a taxi to collect us from Vancouver Airport to Horseshoe Bay ferry terminal and met us the other end to give a thorough run through on how to look after our house on wheels and provided lots of recommendations on things to see and do. From the Sunshine Coast we took a ferry over to Vancouver Island and eventually concluded our trip with a run up the Sea to Sky highway. We did 1000km in 10 days, so not too much driving, and saw a fabulous mix of the sea, the mountains and plenty of wildlife. All in all we had a brilliant holiday. We would definitely recommend RV'ing as a great family holiday choice and highly recommend Happy Holidays Motorhome Rentals." "Thanks Yvonne. All is perfectly in order thank you and the vehicle was excellent. We run a blog at kylefun.blogspot.com so you can get a day by day report of where we went in your vehicle. 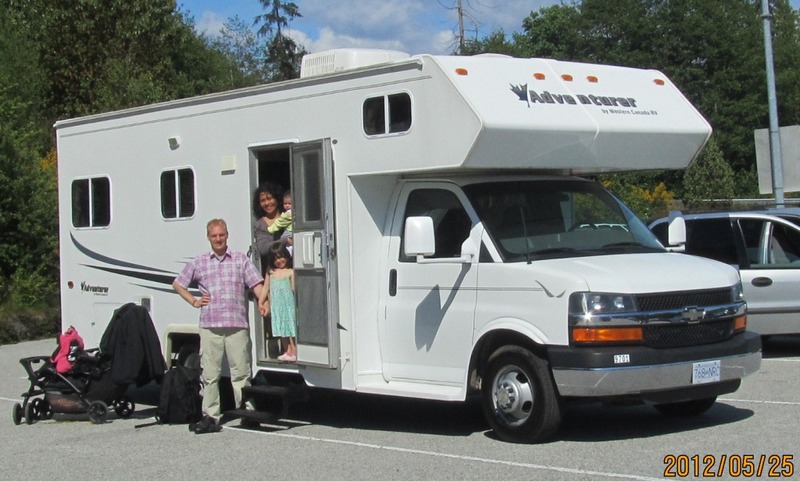 Regards"
"We had a wonderful time in the RV from Happy Holidays, Yvonne and Rainer had taken care of every detail including meeting us at Langdale Ferry, Taxi back to Vancouver as well as advice on ferry times for our trip to Vancouver Island. We thoroughly recommend them above the competition (which we have also tried in the past). See you again!!" First of all we like to thank you all for a unforgettable holiday in BC. The RV was great, had everything you need in it, and the survive when i had a question was perfect. We will make a comment on your website, and we let the website server know that your company is worth looking at. Thanks to you all, and we will recommend other BC travels to look on your website. " We had a fantastic time in Canada – The RV was fantastic fun and gives us many happy memories – thank you for making it so easy. I will look out a couple of photos and give you a comment for your web page – would certainly recommend you. First day nerves with size of vehicle soon replaced with confidence. Nous gardons de très bon souvenir de notre aventure. wir sind gerade aus den Staaten in Old Europe zurück und genießen die tollen Erinnerungen an Kanada! Das Motorhome war super und wir haben durchweg positive Erfahrungen mit Ihrem Fahrzeug gemacht. Wir können Sie und den Urlaub mit dem Motorhome jederzeit uneingeschränkt empfehlen! Beste Grüße – und sagt uns bitte, wo wir Euch empfehlen können!" vielen Dank für die Infos. Wir wollten uns auch schon längst bei euch gemeldet haben um euch zu sagen, dass wir sehr zufrieden waren mit dem Camper und der ganzen Organisation. Vielen Dank dafür. We had a fab holiday and will certainly recommend you to friends. "We had a great time thanks Yvonne and Rainer and the RV was great. We will certainly miss touring and hopefully will be back again soon. Thanks to you we had a wonderful time and made lots and lots of great memories. "Thank you for the invoice and all your organisation which made our first rv trip such a success, I will email some photos from my phone. We really appreciated all the additional thoughtful touches such as the cards, washing line, washing liquid etc as they are things you take for granted. Travelling by rv meant we could really enjoy the beauty of the provincial parks at an affordable rate rather than staying in motels or risk camping under canvas in bear territory! The service you offer as a motor home company is really quite exceptional, thank you. Thank you in advance for arranging our return taxi back to the airport for Friday morning, 22nd August. We will be getting the 8.30am ferry so could meet the taxi at 9.10amas we need to be at the airport for 10.30, should we expect a north shore cab as before? Thanks again in your organisation and thoughtfulness in arranging our rv trip"
"Thank you very much for the final account information. I would like to express our gratitude for the excellent service. We had a fabulous holiday, thanks in great part to you and your organization and early enthousiasm. We really love the RV, it was cosy, convenient, economic, well equipped and great fun. We also very much appreciated your initial email contacts about the weather, the budding flowers, etc, because these brought us in a early stage in a holiday longing mood. We also appreciate the service regarding the ferry transport and your assistance with the transportation. Thanks for a making a great holiday possible. We are happy to submit a report of our experiences with your company online. Is there a particular location where you would like us to submit such a note? Cheers..."
"During our research to rent a RV for our tour to Canada and North-West of the USA we found Happy Holidays on the internet. From that moment started a pleasant, clear and personal communication with the owners, Yvonne & Rainer. Beside a fair/ concurrent price was this the reason to rent the RV with them. After a warm welcome we find out they where travellers too and know how to treat them. The RV was what we expected and well fitted out. Unfortunately, in the third week, there was a small defect at the RV. Directly we get a confirmation to repair and as soon as possible we were back on the road again. The costs we made for an overnight stay they reimbursed without a question from our side. At that moment you know they’ve got the same moral compass. When friends of us are planning a trip for a tour in Canada we certainly recommended Happy Holidays. We wish Rainer & Yvonne success to continue their business at this way. Best regards from the Netherlands." It was a wonderful trip and your motorhome made a pretty huge part of it so again thank you very much for providing us with such great services!! We really appreaciated it. Hope we will come back to Canada soon as the country and untouched nature charmed us so much. It will be pleasure for me to share our great experience with your company and services on your web pages. I will do so as soon as I get to the photo sorting (we have more that 3000 pictures :-)) so I would like also to upload some of them. We all loved our visit to Canada. The landscapes, wildlife but also the people we should not forget. We discovered that Canadian people (we have met) are friendly, helpfull and interested, an attitude what’s difficult to find in the Netherlands/ Europe. 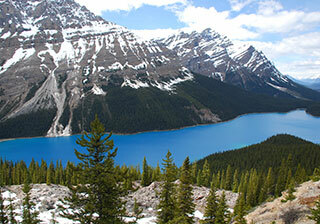 If friends of us, will plan a trip to Canada we will recommend your company! With NO doubt. "Vielen Dank Yvonne & Rainer, wir haben die Zeit in Eurem Wohnmobil sehr genossen, selbst bei großer Hitze oder kaltem Regenwetter in Whistler, alles war dabei. 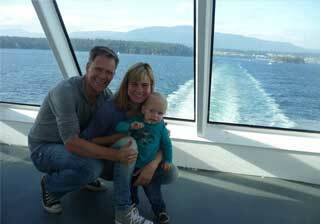 Sonnige Grüße aus Nanaimo sendet Euch"
We really had a great time in Canada and USA. The motorhome was the best we had ever. It made our stay even better and very enjoyable. Kim had a great time with his freeski camp in Whistler and we enjoyed hiking, Biking and the wonderful nature in BC. We would like to thank you again for your support, the perfect service and your friendliness. thank you so much for the great time we had back in Canada - all thanks to your perfect service. Of course we will write a 5 star recommendation on tripadvisor.com Kind regards,"
"Leigh and I appreciated the personal service given by you and Rainer and how well the package worked for us. 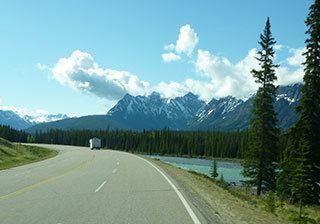 We think it is a great way to travel and hope to return to BC some time and explore more of your beautiful country. All the best." "Your customer service was fabulous, your service is outstanding. The least to say is that I loved your vehicle. It was comfortable, reliable, and was certainly worth the value. You were helpful, kind, accommodating and understanding. Simply put, without your valuable service, my vacation would have simply been impossible. Thank you and I wish you luck in your business. From my side, I would strongly refer friends and colleagues." It was lovely to meet you today, and thank you again. We had a wonderful holiday. Also we noticed that we had little extras in the camper that others did not seem to have that made it more enjoyable, like the little axe, matches, the yellow leveller things and even having the salt and pepper." "Thank you so much for trying! That's the type of service that has me so impressed by your business. Can't wait to meet you guys." "Thank You very much!! It was definitely super meeting you all!! We had a greaT time and loved camping in all the beautiful places throughout BC. Campers were great! Enjoyed every minute on them!! Us as well as the Navarretes! Sure hope we can do it again some day and you can be sure we would rent them from you again!! Thank you much for everything. We are glad everything was okay. Best regards." 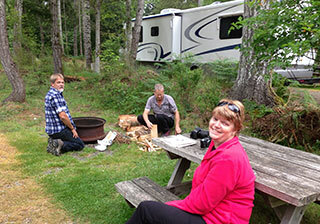 "Hi Yvonne, we had a great time with the Motorhome - it gave us the freedom and independence that we were seeking. It also enabled us to find some really wild places to explore. A very memorable holiday. You and your staff were brilliant! My wife is keen to replicate the holiday in some way after seeing our photos! Wishing you and Rainer a very Happy Xmas and a prosperous New Year." "Thanks for all your help in making our holiday very very good. It was a pleasure to meet you. 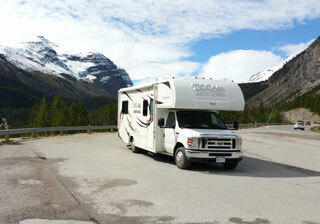 Regards..."
"Our travels with the motorhome around BC and Alberta were fantastic! After picking it up on time and meeting Rainer, we went right on to start our trip. It was very practical to travel with the RV, because even though we had to stay on an overflow parking a few times, we had everything that we needed. And in the cold of the Icefield, the heating was very welcome on a 1°C morning! Except when our cupboard sprang open in a bumpy turn in the road and a few glasses fell out, which Yvonne and Rainer replaced without charging us anything for the accident, we had a great trip and are back in Switzerland with lots of fond memories of Canada and are hoping to return someday." "Thank you so much for a wonderful holiday memory and motorhome experience. You have gone above and beyond all expectations.The motorhome was clean, very very well equiped and a real pleasure to drive. Everything was meticulous. Happy Holidays will part of our next adventure to the beautiful province of British Columbia. The pick up and drop off of the motorhome in Gibson was well organized and worry free. Looking forward to seeing you on our next adventure. Thank you both so much for helping make our dream come true. Sincerly,"
"We rented a camper in august 2013. On our arrival we were received with warmth! Yvonne and Reiner gave us all the important instructions as how to use our camper. The camper had all the necessary equipment to make a great trip. We were gladly surprised by the kindness of our hosts. They made it easy for us to travel from the airport to the pickup place and back at the end of the trip. Schedule was respected. Along our vacation they were available and helping to solve some problems we encountered. They were flexible on the terms as much as it was reasonable. We really recommend these people for a vacation in BC." "...we are all fine with the memories of our RV holiday fresh in our minds. BC is certainly a fantastic place to visit. It was a pleasure to deal with your company and be serviced so well. We hope to visit again. Warmest regards..."
"We are thinking to come over in September again, as we should be quieter with work then so can escape for a month. I hope that business is still booming for you guys, you are a lovely family and a fantastic customer service which I'm sure is why you would get so many people returning to hire again and again, so much better than hiring from a faceless larger company." "Thank you so much for your help at that time and your help prior to the holiday itself. The arrangements for pick up and drop off were really good and took the stress out of having to organise that transfer from and to the airport. I found the van very easy to use and a pleasure to drive. Your guidance as to where to get propane etc. was very helpful. It was very handy to have the microwave. There was plenty of storage space as well. Thank you once again for all your help in making our holiday really enjoyable!" 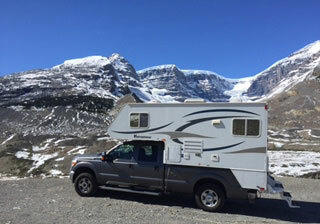 "We had a marvellous holiday in Western Canada and the motor-home met our needs very well. The vehicle had been well prepared and was clean, functional and comfortable. We appreciated the courteous service by Yvonne & Rainer and would happily recommend Happy Holidays Motor Home Rentals to other travellers." "We are just heading back and I wanted to say thanks for everything. We had a fantastic time and it is a trip we will never forget." "Hello Yvonne It has only been 2 hours since we handed over the RV, and we are now comfortably settled in our Vancouver hotel. Thank you for your hospitality and for the most welcome Swiss warmth and efficiency of yourself and family. We thoroughly enjoyed driving and living in the RV: a bit nervous at the beginning but soon got the gist of driving such a vehicle and understanding how the 'living quarters' work. My bed, over the cab was very comfortable, and Jim had no complaints about his bed either. The only suggestion is to provide extra pillows in order to prop oneself up for reading in bed. It's been a fantastic trip/experience. All has gone extremely well - thank you!" "We had a fantastic holiday. We just wanted to say thank you for all your help when setting out with the RV. We had a great time touring in your van. It was all we expected and then some. You have everything down to a fine art. We couldn't have found anything better. The weather was fantastic, only one wet day in all the time we were there. We stayed quite a bit in the provincial parks which were quiet and secluded. We bought some firewood and really enjoyed the outdoors. We are glad you enjoyed the wine. It was our way of saying thank for the great holiday we had. We hope you go from strength to strength and we would not hesitate to recommend you to anyone wishing to hire a motor home from you." "Dear Yvonne and Rainer, we are back in New York and don't want to miss the opportunity to thank you for making possible one of the most wonderful holidays we ever had. 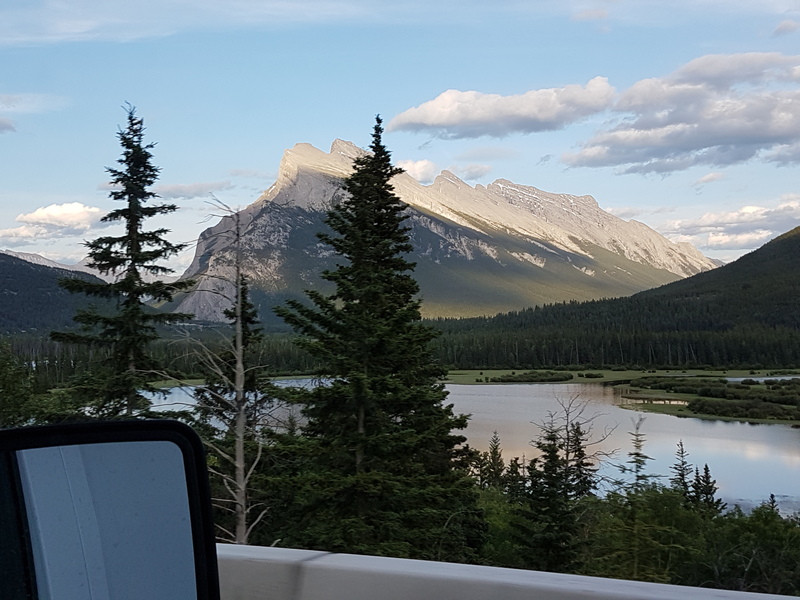 Driving in a motor home through the Rocky Mountains in British Columbia and Alberta was an exhilarating experience, particularly the Ice Fields Highway. The RV worked like a Swiss clock (no pun intended) and did not fail us even going up steep hills. Thanks to Rainer's technical briefing, we found everything easy to operate. Your tips on where to go in B.C. helped us to find some of the most enjoyable places and sights. Our last day at the Vancouver Aquarium in Stanley Park was a very pleasant experience, not the least because of the taxi service you had organized. We shall return! Please allow us to recommend your service to our friends since we truly enjoyed yours and Rainer's warm welcome, friendly advice and support. All the best,"
"It was a wonderful trip and with great memories as an extended family. I'm happy to offer a testimonial here, feel free to quote me! 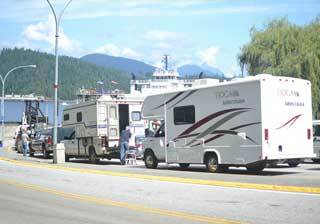 Happy Holidays is the absolute best option for RV rentals when traveling BC's Sunshine Coast. We book with them every year for their incomparable value. They are friendly, flexible and accommodating. We've never had a problem with their vehicles. My family loves what we call our "hotel-room-in-nature"! See you next year..."
"Just a short note to say thank you for the friendly service you afforded us which gave a great start to a very enjoyable holiday. The motorhome had everything we needed and was very comfortable it really gave us the flexibility to plan our holiday as we needed. It was easy to drive and had plenty of power to handle the terrain we traveled through. Once again your personal approach really made a difference and when we return to V.I. we look forward to hiring a motorhome from you. Kindest regards..."
"We recently traveled as a family around BC for two weeks with the help of Yvonne and Rainer and the use of a Happy Holidays motorhome. The motorhome was the perfect size for the four of us and compared to others we have used it was very well laid out. It was clean and tidy, and with plenty of modern features to make life easy. However what really impressed us the most was not the product but the service. Booking an important part of the holiday as this was, over the internet and in a foreign country we have never visited, can bring some worry. From the first reply they quickly put our minds at ease with their friendly and very helpful manner. Their communication was quick and clear. We asked many questions and made some late changes however when we landed in Vancouver we had a clear plan to meet them and the free transfer service was a great bonus. The ferry trip across to Gibsons was beautiful and a great way to start the holiday. We totally recommend Happy Holidays." "It was a pleasure meeting you two and have great communication, friendly and informal. Always nice to meet likewise minded people. You were also so kind to pick us up with the RV at the parking lot when we arrived at the ferry. After doing the paperwork and after the great explanation about the RV, we were ready to go. First shopping, and then back on the ferry on our way to Whistler. We enjoyed traveling with the RV. All clean and complete. Too soon it was time to bring the RV back. Great to see you again, like meeting friends. And thank you, Rainer, to bring us back to the ferry! With good memories, we were standing outside and said goodbye to your beautiful country! Warm regards,"
"Thanks Yvonne, we did have a marvellous time and we've recommended you to other friends. 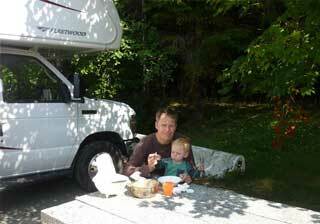 With best wishes,"
We (a familiy of five people) rented a motorhome to Happy holidays during the sommer 2013. Everything went on very nicely. The taxi which picked us up at the hotel was on time and we met Yvonne and Rainer at Lansdale as planned. After a short but pleasant, friendly and clear introducing to the motorhome, we headed back to Vancouver. 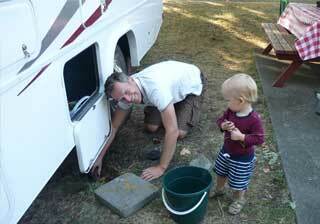 The Motorhome was very well prepared and cleaned, we had no problem with it. At the end, when we had to return to the airport, Rainer organised a taxi for us. No extra cost for it, wonderful with all the luggages, we really appreciated it. We spent wonderfull holidays and we strongly recommand this company. 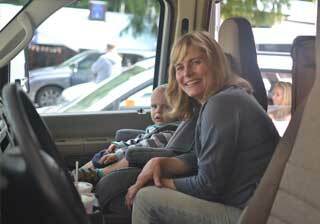 Don't be afraid to have to get the motorhome to Gibsons, it is no big deal as Yvonne and Rainer makes it easy and affordable. Thanks Yvonne and Rainer I hope to come again in the future. Many regards..."
We returned safely to Munich. thank you for your excellent help with everything inside and outside the rental of your motorhome. We can confirm that we are very pleased with the entire arrangement. We will recommend your organization, whenever we have a chance to do so. All the best and hope to see you again. Best regards..."
"We had a blast, it was great! Thanx"
"We had an amazing holiday and would do it all again - the trip through the Rockies was awe-inspiring and I'd do that again in a heartbeat, so thank you for helping us to have such an amazing experience - our photos bring back lots of happy memories and everyone who has seen them has been very impressed with what we saw." Thank you for the final account details. If you would like to use some or all of the feedback below, please do – we will have no hesitation in recommending Happy Holidays and yourselves to anyone we know who thinks about holidaying in Canada in the future. We had a wonderful holiday and have really enjoyed telling family and friends all about our travels and experiences around British Columbia, our holiday was made all the more special by the excellent motor home and service provided by Yvonne and Rainer at Happy Holidays; their attention to detail and little touches to make us feel relaxed and welcome made for an above-expectations holiday experience from start to finish. Thank you Yvonne and Rainer. Best Wishes for the rest of the season and future years." "Hi Yvonne and Rainer. Thank you for sorting out the repairs and sorry for any inconvenience caused. 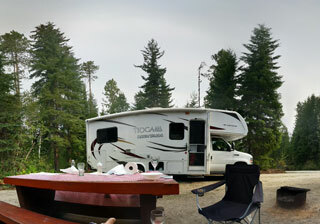 Thanks to Happy Holidays we had an amazing motorhome experience in Vancouver. The service was very friendly and welcoming. When we return to Vancouver, we will be sure to call on Happy Holidays again. Many thanks..."
Found Yvonne & Rainer at Happy Holidays Motorhomes very accommodating and the pick up and return of the motor home at the Langdale ferry terminal certainly helped for a quick and very picturesque start to our holiday, after pick-up we returned on the next ferry and travelled up to Whistler on the Trans-Canada highway. The motorhome was clean, spacious, easy to drive and never had any mechanical issues. The information pack we received was a very helpful addition to our own maps and schedule. We had only one problem with the toilet and a quick phone call to Rainer had the problem sorted, could have done with a second pillow each but this is a personal preference and easy fixed. Thanks again Happy Holidays." "I just wanted to send a Thank You email for you all. We had such a great time in the RV and had such a relaxing time. We have rented RV's many times from other companies in the US and Canada and you were by far the nicest and the most friendly. I will be mentioning you to my friends that are thinking of coming to Canada to do as we did and travel in an RV, I will also definitely be using you again in the future. Again I wanted to say a huge thank you for an amazing and excellent service from Happy Holidays. Many Thanks..."
"Dear Yvonne and Rainer, thank you once again for making our holiday to BC so memorable – after 10 wonderful days in our temporary home-from-home, Harvey the RV, we arrived home safe and sound at 9.15am this morning after a smooth and uneventful trip between Langdale and our home near London Gatwick airport. I would be happy to complete any sort of customer feedback or questionnaire form, if you have one... otherwise I thought I would add something to Tripadvisor – do you review that website? Best wishes to you both for a successful summer and once again thanks for making it so special for us. Kind regards..."
"Thank you for providing a lovely RV and for being so useful when planning our trip. Kind regards..."
"We had a great experience renting a motorhome from Happy Holidays Motorhome Rentals. We are a family of four and traveled around BC, Canada during the month of July. The RV was beautiful, in great condition, and well-stocked with all the camping necessities. You deal directly with the owners and the service is unbeatable. We recommend them highly. Five stars." "Again thank you for the wonderful service. We both had a fantastic time, wishing we could have stayed even longer. The RV was Perfect and a suited our needs perfectly. Apologies for leaving it battle scared. We have Hundreds of Photos and when we sort ourselves out we will share some with you. 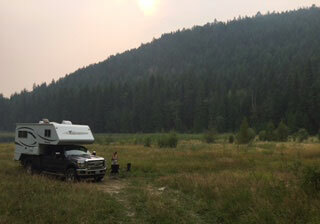 Many thanks again,"
"We had a good time in BC with the mobile home we rented from you guys. Our travel story is now available at www.pellefant69.se . Best regards,"
"Many thanks for your part in making our holiday so enjoyable, the motorhome was great. We really appreciate the way you have dealt with us. Should we return to Vancouver we would certainly use your services again and have already recommended you to our friends in Vancouver. Thanks again,"
"We really enjoyed our trip to Vancouver and the Rockies. We also enjoyed our first motorhome experience and as a result went this week to a show of new motorhomes which took place in Birmingham. We are not ready quite yet to make a switch from our caravan especially as we have a pretty modern one and recently bought a new tow vehicle. But our trip in your vehicle showed us the positives of motorhomes. Thank you,"
"Thanks Yvonne for your great support throughout our Canadian adventure." "Thank you for your nice message. We were really happy to meet you and about the service you gave us. Faithfully yours,"
"We had a lovely holiday and were very pleased with the performance of our rental vehicle. Once again thank you and we enjoyed doing business with your company. Kind Regards,"
"Well yes we are back home in Gloucester NSW Aus. and our hearts are still in beautiful BC. We had such a wonderful time and all the more so by being able to travel at our leisure in one of your RV Motorhomes. Thank you muchly for the hassle free experience that made our holiday so memorable. We hope to spend more time exploring your magnificent country in one of your RV’s next time we visit. Kind Regards,"
"We had a lovely vacation and really enjoyed the RV. They are very nice units. Take care and we will be in touch next year. Thank you!" "Thanks, we had a great holiday." "I am writing to thank all your fine attention, we spent some unforgettable holidays on Board of the Motor Home, we talked to many families in México, and several of them will surely contact you to rent Motor homes in the next future. Again I very much appreciate all your support, we had fantastic days with the family, and hope to have the opportunity to go again. My best wishes,"
"I hope Rainer conveyed to you what a great trip we had in the RV. We found the landscapes and hikes amazing and really enjoyed the RV camping. We all fitted into the RV and the sleeping arrangements worked well; it’s a really well kitted out van with just about everything you could think of on board and the storage areas are really good too. Best wishes and many thanks,"